Good attendance is very important. It is important for learning. A child who is in school regularly will find it easier to keep up their friendships. They will also get to know teacher better and settle in better. Certificates for full attendance, termly and yearly. End of term and end of year prizes and awards. Notes home for children whose attendance has improved. Highlighting good attendance – mention in quarterly newsletter, class banners, photographs and attendance board. Monitoring of attendance in each class on a daily basis. Group Work & one to one consultation with selected children. Transfer programme for 6th Class pupils. We understand that sometimes children are unwell, however even missing 10 days every year would be the same as missing eight weeks of school: the same length of time as the summer holidays here in Ireland. 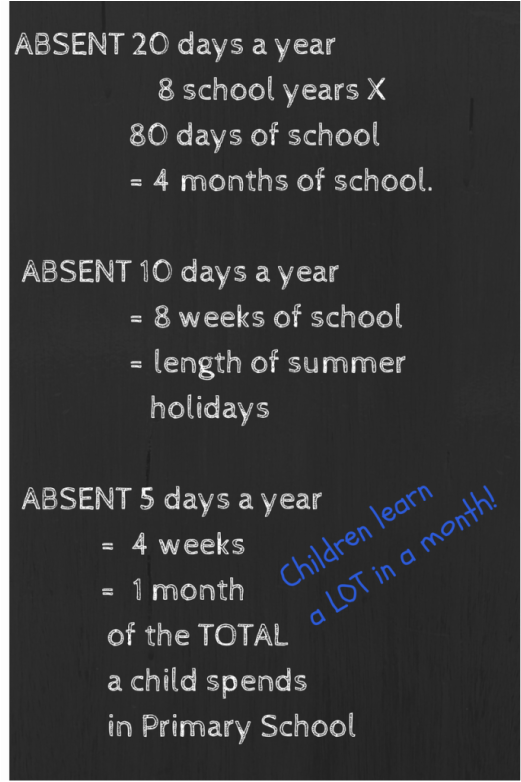 Taking even a week off school each year to go on holidays takes one month off the number of days a child comes to school in their school career. We can learn a great deal in a month. ​When a child is marked absent on DataBiz roll, the reasons for the absence is entered as soon as that information becomes available. This allows the school to categorise the absence, such as unexplained, illness, urgent family reason etc. This information will form part of the reporting procedure sent to the Educational Welfare Services section of the Tusla - Child and Family Agency. Under the Education Welfare Act letters must be sent home, drawing parents’ attention to poor attendance, after 10, 15 and 20 days absence. When a child has been absent for 20 days we notify the Educational Welfare Services section of Tusla - Child and Family Agency. The School has no discretion over handing this information on to Tusla – Child and Family Agency, regardless of the reason for absence. - However, Tusla – Child and Family Agency will take account of absences due to illness, bereavement or other such circumstances - There are four periods during the year when we are obliged to report information to Tusla – Child and Family Agency. Additionally, Tusla – Child and Family Agency request an Annual Report at the end of each school year.